Eighty-two per cent of companies surveyed see the ability to address all five senses in authentic product presentations to be a significant advantage of exhibitions over digital formats. Closely related to that is the finding that nearly 50 percent of exhibitors consider it important that products can be tested at trade fairs with no obligation to purchase them. And 60 percent see a sustainable positive effect for their companies if they can create experiences for trade visitors. 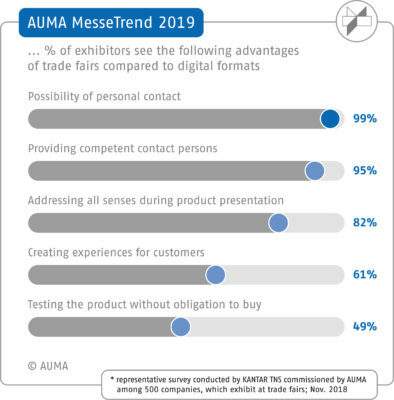 AUMA views the survey results as evidence that most companies clearly recognise how exhibitions can distinguish them from competitors who rely primarily on digital communications. This does not mean exhibitors see the question in either/or terms: 62 percent also use social media in their B2B communications, for example, and 49 percent use online advertising.